Today’s update features a very exciting experiment, one which could revolutionize the webcomic world! In order to make surfing the Internet safe and enjoyable for users of all ages, we here at BMC, together with our friends from the Campaign for Webcomic Decency have developed two completely different versions of today’s strip. 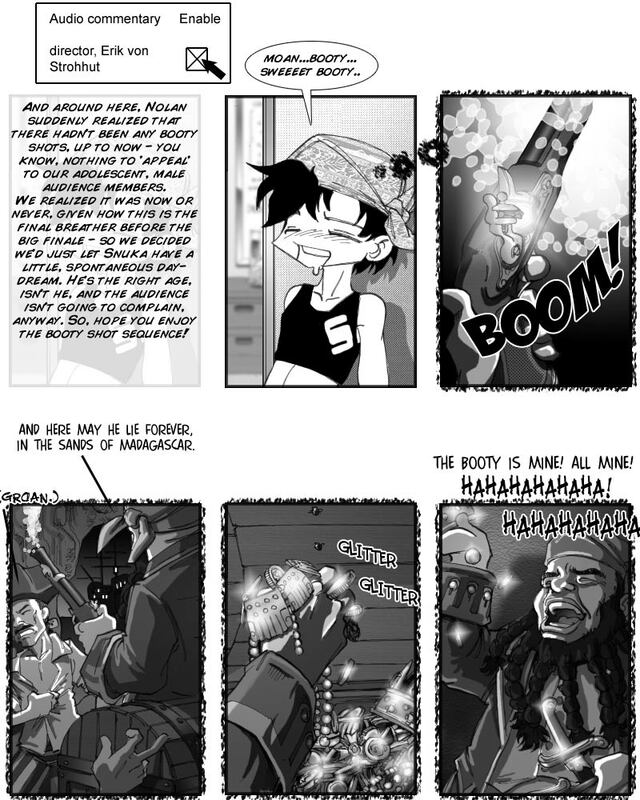 They differ in the last four panels – both feature booty and shots, and both are totally plausible as things Snuka could daydream about. But while one version is sexually themed and R-rated, the other features an adventure/Pirates theme and is rated PG. The moment you load the page a highly sophisticated piece of software, supplied by the CfWD, checks your browser profile and automatically displays the version that is appropriate for you. I think this will really be a major step forward, as far as protecting innocent minds from inappropriate content goes. This fantastic piece of fanart is by McDuffies, who has not one, not two, not three, but about a myriad great and mostly seriously funny webcomicky things here, and one more here. And yes, that’s pretty much what would happen if Biff would approach Mopey romantically. Well, let’s say it would be the best-case scenario. I’m also slowly getting around to updating the links section. Krazykimchi has been added (another fine example of lots of awesome webcomic stuff collected on one site for your convenience), but there are dozens still on my list. -_-; I don’t know if I’ll ever be current with that. Finally, a new voting incentive goes up today, featuring a movie title taken literally. More on Thursday.